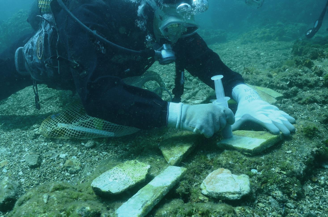 This activity involves the formulation of products with consolidating and antimicrobial action, which will be applied on stone materials that have to be kept in underwater environment. Photocatalytic materials, such as titanium dioxide, have been used. The products were examined through analytical techniques, in order to characterize their structure and their physical and chemical properties. XRD and XPS reflectance measurements were carried out too. Tests have been conducted by releasing the active principles in water, in order to evaluate the waterproofing properties of the coatings in marine environment. 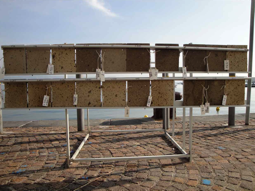 Also the antifouling properties have been tested, both in laboratory and in marine environment, by treating stone specimens and immersing them in the marine site of Baia. The first stage of this experiment was the monitoring of the conditions of colonization of the treated surfaces (a first estimate through underwater photographic documentation), followed by the recovery of the specimens and a number of observations in order to obtain more detailed information about the biological colonization. 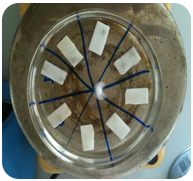 From the first monitoring carried out, it is clear that some products cause a decrease in the percentage of biomass on the immersed specimens. The monitoring activity for longer periods of immersion is in progress. The application of the formulations on a stone substrate, performed directly in underwater environment, is a key point of the entire project. Three different approaches are currently being followed to achieve this goal. A first solution consists in applying a wax containing the biocide directly on the stone material. The application, which is done by rubbing, would ensure the presence of a layer of protective material sufficient to ensure its effectiveness. The preliminary tests have shown encouraging results. The second method consists in the application of epoxy resins, which provide a quick setting in underwater environment, but may present serious problems in terms of reversibility. At present we are verifying, through laboratory and marine tests, the applicability and the reversibility of some products loaded with our innovative, synthetic products. The third method consists in using a sort of silicone bell with a hollow space on its bottom that, once placed over the stone surface in underwater environment, acts as a vacuum chamber from which the water is drained by means of a pump, creating a depression that ensures the adherence of the bell to the stone surface. This makes it possible to drain the liquids and inject the protective consolidant. The determination of water repellency of the treated materials is instead evaluated by measuring the value of the contact angle. The water repellency is useful for evaluating the adhesion properties of biological species on the treated surfaces. In fact, an antifouling method, alternative to the use of toxic substances, is to create non-stick surfaces, with a contact angle exceeding 150° - the so-called superhydrophobic surfaces - which make the surfaces non-wettable. In order to exploit this property, we're conducting another experimentation consisting in depositing superhydrophobic substrates, based on titanium dioxide, on archaeological finds.